When we first mulled over the idea, we knew we wanted the party taken to a new level. Yes, some may feel it is a bit extravagant, but looking at other options of bowling parties, activity zones, and other options for 9-year-olds, it only cost a few hundred more for THE party of a lifetime. You know, if a husband gets excited about a kid’s party, there’s credence to it. We started by contacting the Gamin Ride Company. They offer several services, such as a gaming trailer with the player capabilities of 24. Prior to booking we clarified the length of gaming time, the space needed for the trailer (50 ft.) and the set-up time involved to closely time our activities. Have the gaming trailer park outside our house. Have our own gaming system that allows for up to 4 players ready. This way no child would have to wait for a gaming seat(we had 26 kids). Prior to the set-up, the kids and their parents would have time to eat appetizers, pizza, wings, and Minecraft goodies. We made the Minecraft invite by using images off of shared creative sites such as Minecrafty or The Skindex and a paint program. For those who aren’t quite creative or don’t have the time, skins can be found anywhere, such as Planet Minecraft and download user-made skins. For the text, we downloaded a free Minecraft font from dafont.com. 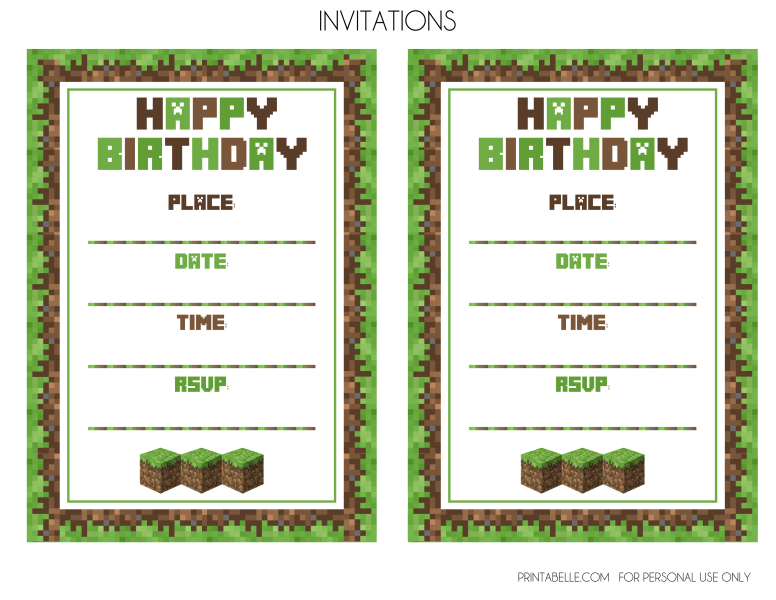 We could have used the many free printable Minecraft invite templates from Catch My Party, Oh My Fiesta and plug in the fonts. Yet, since our birthday star was a girl, we felt the most common Minecraft invites could use a feminine touch with a girl character. We set the time for the party to begin an hour and 15 minutes prior to gaming. This would allow for nibblers to snack while the wings were in the oven and until the sheets of pizza arrived (about 45 min. later). I slotted a half hour prior to gaming for lunch. The pizza came exactly on schedule ( we placed an advanced order and reconfirmed the morning of party). The wings were timed to the delivery. The party was going awesome with kids everywhere. With their parents asked to stay for the party, the hosts had time to relax instead of continuously playing referee and babysitter. Some would say the noise volume of so many was hard to take, but with our spacious abode, we had quiet rooms for parents to relax and escape. After lunch was over and close to the time the trailer was expected to arrive, the high noise level continued as kids traded controllers after so many minutes of using so all could have a turn. At 1pm, the trailer was still a no-show, so we started making phone calls. First the company said they’d send a message to their trailer workers. At 1:15, no trailer was still in sight and the kids began to get anxious (let alone the parents). Back on the phone, we were told they were 10 minutes away. Ten minutes went by and another phone call was initiated. Finally the trailer pulled up at 40 minutes late. Unlike what we were told and what was previously stated on their website. Gamin Ride did not say we needed to provide our own seats for their outdoor stations. Yet, luckily, some of the kids preferred to stay inside with our system rather than go into the trailer. We also had lots of lawn chairs on hand. The company also failed to mention the awning with game systems would be facing into the street (blocking traffic), but luckily we were on a dead end – which would have caused problems if my last three neighbors weren’t so nice. That 4D experience was a little misleading as well. After speaking to many of the kids after gaming, they said the didn’t experience any other (smell or 3D) from their games. But they had no complaints and were all gleefully happy just to game in one big group. Honestly, as an event planner, one doesn’t have any control of what other vendors do. So although we reconfirmed everyone, life happens. Flat tires, misunderstandings, and that’s the short list. After returning to the company’s website this week, I did see they have begun to become more transparent by changing a few of their pages. The kids honestly were good kids – even with the late trailer. The game company made amends for their error and ended up giving us a bigger package than we purchased. With a personalized mixed video of the gaming action, wristbands, and a group photo/frame, THE party of a lifetime was forever saved in both our minds and in media. What more could we want? During the time we waited for the game trailer, we switched the schedule for playing Pin the Tail on the Minecraft Pig before the gaming. The tutorial for making the game is found in Part 1: Minecraft Madness. All in all, even the parents that attended said they would like to do a party like ours. From the Minecraft invites, decorations, appetizers, snacks, and cake, it is a lot of work. But with hard work comes often great reward. The smile on those 40+ faces was priceless. Coming Next: Part 3 of Minecraft Madness – tutorials on decorations, party favors, table decor and party bags. 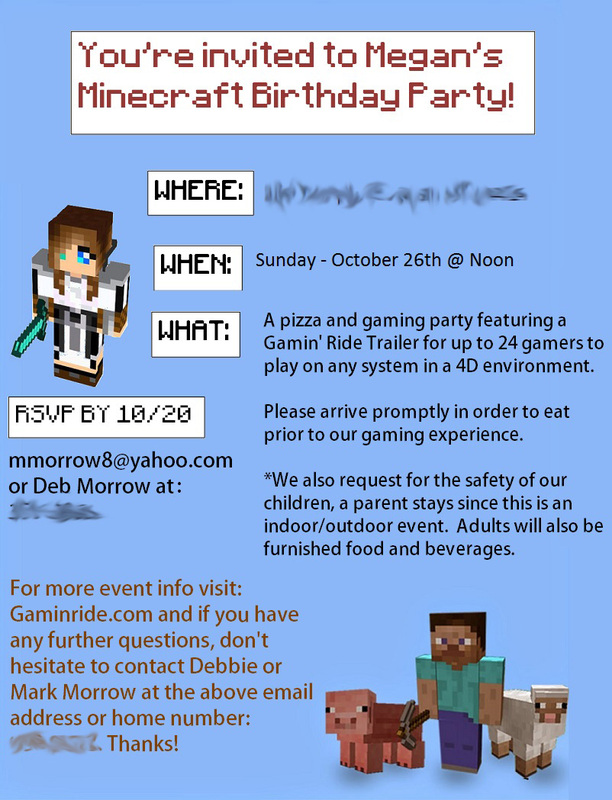 This entry was posted in Party Ideas, Uncategorized and tagged A girl's minecraft party, gaming trailer, INVITATIONS, Minecraft party ideas, Minecraft skins, Planning by thewritegirlforthejob. Bookmark the permalink.